Single-income families have different needs than dual-income families. Have you dreamed of making it work as a single-income family so one parent can stay home full-time with the kids? Have you inadvertently become a single-income family due to a layoff or illness? Regardless of your situation, when you become a single income family, you'll likely need to adjust your budget and living expenses. 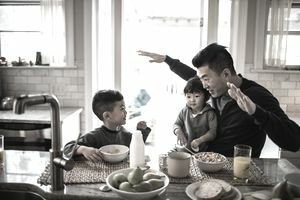 Read on for five financial moves to make as a single income family, so you can ensure that both your family – and your budget – are well taken care of. One of the first things you'll need to do if you become a one income family is adjust your budget. Create a workable family budget based on your family's single income. Remember, you may need to cut corners to make your new lifestyle work, from cutting cable to saving money at the grocery store to forgoing eating out at restaurants. Unless your family's single income is extremely high, you'll definitely need to cut back and save money if you choose to become a single income family. Just because your family is moving to one income doesn't mean you should stop saving altogether. In fact, you should make it an even bigger priority. Savings accounts like your emergency fund and your rainy day fund should be fully padded before you make the leap from one income to two. Financial experts suggest saving at least 6 months' living expenses in your emergency fund, but if you are a single income family, you may want to increase that amount to a year of living expenses. After all, if you are living on one income and have a family, you'll need an even bigger safety net if the household's only earner loses their job or has an unexpected emergency that prevents them from working. Your rainy day fund should also be well-funded. This account is meant to pay for unexpected, one-off expenses. If your family is only living on one income, chances are, you won't have as much disposable income to put toward any unexpected expenditure. As a single income family, you should also continue to make retirement contributions. If you plan to live on one income for the foreseeable future, you should also double your retirement contributions. Think about it – the breadwinner needs to compensate for the loss of the other spouse no longer making contributions. Many families make the mistake of not getting life insurance for both partners, regardless of who is employed. While you definitely need the breadwinner to have a good life insurance policy, don't forget about the non-working spouse, as well. If the non-working spouse passes away or suffers from a serious illness or injury that renders them unable to look after the children, then the working spouse would need to outsource those tasks, which could cost you big. That's why it's a smart financial move to have a life insurance policy on both parents in a family with children. If you haven't already made the leap to the one income lifestyle, start doing it in stages. First, adjust your lifestyle – and budget – so you can live solely on one income. This is an excellent opportunity to see if living on one income is realistic for you and your family. If you are able to live on one income while both spouses are still working, this is a good opportunity to save money, since you'll be saving the entirety of one person’s income. You can use this time to pay off your debt, build a substantial cash cushion, make massive retirement contributions, or save for your children's college. For many families, too-big expenses include a mortgage that is too expensive, car payments, dining out, buying clothing, or credit card debt. If you can slash these expenses, you can solve a lot of your financial stresses, and make the transition from two incomes to one a lot smoother. Declare a one-month ban on dining out. Commit to eating every meal at home for 30 days and see what a difference it makes to both your budget and your waistline. If you have to eat a meal outside of the home, brown bag your lunch. If you have an expensive mortgage, consider renting out a room to a housemate. If that’s not something that appeals to you, downsize to a smaller home. Are you carrying high car payments? Try selling your car and buying a cheap, used vehicle with cash. Drive the same type of vehicle that a college student would drive. Don’t feel as though this is beneath you. Think of it as a smart financial move. While examining your budget and cutting costs is never fun, consider it an investment in your family's future.